Op deze pagina vindt u een overzicht van mijn publicaties. Via e-mail kunt u contact opnemen voor een PDF van deze publicaties. Van der Hoeven, A. (2014). Popular music memories. 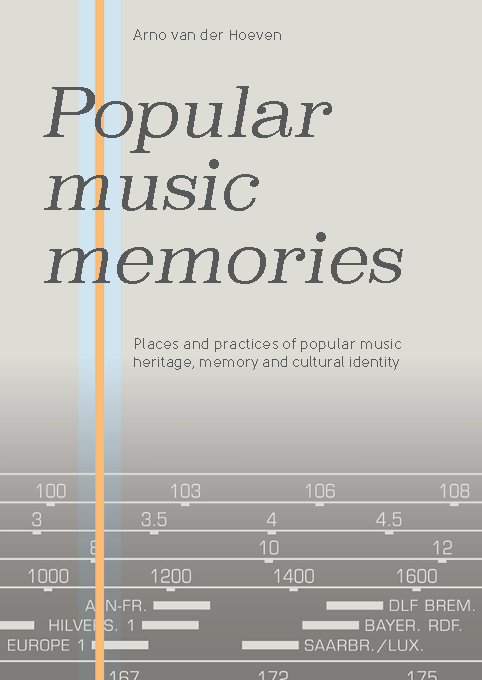 Places and practices of popular music heritage, memory and cultural identity. Rotterdam: Erasmus Research Centre for Media, Communication and Culture (ISBN: 978-90-76665-26-9). Van der Hoeven, A. (2018). Narratives of popular music heritage and cultural identity: The affordances and constraints of popular music memories. European Journal of Cultural Studies, 21(2), 207-222. Van der Hoeven, A., Janssen, S., & Driessen, S. (2016). Articulations of identity and distinction: The meanings of language in Dutch popular music. Popular Music and Society, 39(1), 43–58. Van der Hoeven, A. & Brandellero, A. (2015). Places of popular music heritage: The local framing of a global cultural form in Dutch museums and archives. Poetics, 51, 37-53. Van der Hoeven, A. (2015). Remembering the 1960s: popular music and memory in Europe. International Journal of Cultural Policy, 21(3), 258-272. Van der Hoeven, A. (2014). Remembering the popular music of the 1990s: dance music and the cultural meanings of decade-based nostalgia. International Journal of Heritage Studies, 20(3), 316-330. Van der Hoeven, A. (2012). The popular music heritage of the Dutch pirates: illegal radio and cultural identity. Media, Culture & Society, 34(8), 927–943. Van der Hoeven, A. (2018). Songs that resonate: the uses of popular music nostalgia. In S. Baker, C. Strong, L. Istvandity, and Z. Cantillon (eds.). The Routledge Companion to Popular Music History and Heritage (pp. 238-246). Abingdon: Routledge. Brandellero, A., Van der Hoeven, A. & Janssen, S. (2015). Valuing popular music heritage: exploring amateur and fan-based preservation practices in museums and archives in the Netherlands. In S. Baker (Ed. ), Preserving Popular Music Heritage: Do-it- Yourself, Do-it-Together (pp. 31-45). London: Routledge. Van der Hoeven, A. (2015). Streektaalmuziek in Nederland [Regional language music in the Netherlands]. http://www.streektaalzang.nl. Journal of World Popular Music, 2(1), 135-141. Van der Hoeven, A. (2018). U vraagt, wij draaien? Hoe popmuziek een plek kreeg in de uitvaarthitlijsten. (Lezing Funeraire Academie Symposium ‘De uitvaart: daar zit muziek in!’, Rotterdam, 18 april 2018). Van der Hoeven, A. (2016). Verslag Studiemiddag digitaal herinneren in de stad. Erfgoed 2.0 (blogbericht). Van der Hoeven, A. & Van Sterkenburg, J. (2014). Methode: Sterren onder de loep. Sociologie Magazine, 22(2), 12-13. Van der Hoeven, A. (2014). Rwanda’s onverwerkte verleden. Interview met Olivier Nyirubugara. Sociologie Magazine, 22(1), 12-13. Van der Hoeven, A. (2011). Knokken voor het levenslied: De voortdurende strijd van etherpiraten voor het Nederlandstalige lied. Boekman 88 Volkscultuur?, 69-75.